Did that headline get your attention? Yes? Two of Hollywood’s hottest actors share not only a poster but co-starring roles in Focus Features’ The Place Beyond the Pines. 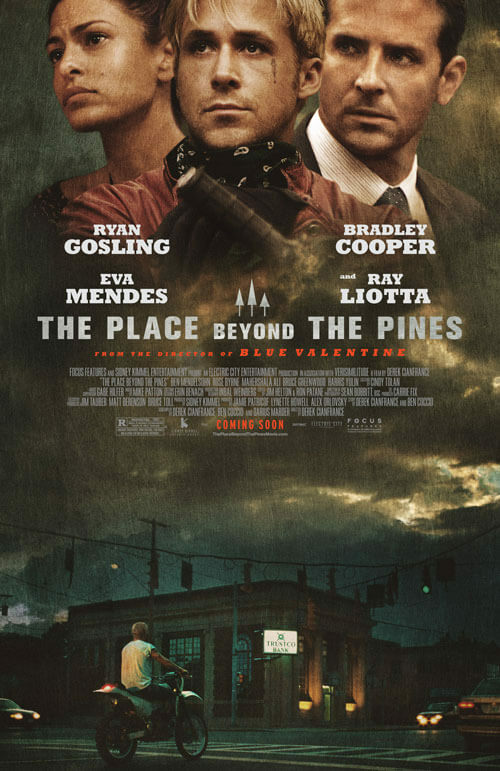 Written and directed by Derek Cianfrance (Blue Valentine), The Place Beyond the Pines also features Eva Mendes, Ray Liotta, Rose Byrne, Mahershala Ali, Dane DeHaan, Emory Cohen, and Ben Mendelsohn. Focus is planning a March 29, 2013 theatrical release of the dramatic film which premiered at the 2012 Toronto Film Festival. Luke (Ryan Gosling) is in constant motion, a high-wire motorcycle stunt performer who travels from town to town with the carnival. Passing through Schenectady in upstate New York, he tries to reconnect with a former lover, Romina (Eva Mendes), only to learn that she has in his absence given birth to their son Jason. Luke resolves to forsake life on the road and to provide for his newfound family, taking a job as car mechanic with Robin (Ben Mendelsohn). Robin soon discovers Luke’s special talents, and proposes to partner with him in a string of spectacular bank robberies. But it is only a matter of time before Luke will run up against the law – which comes in the form of Avery Cross (Bradley Cooper).